Utopia, Part 3: the World’s Largest Shopping Mall | Sam Green | Sam Green - Sam Green is a documentary filmmaker. He’s made many movies including most recently <i>A Thousand Thoughts</i>, a live cinematic collaboration with the Kronos Quartet. Previous “live documentaries” include <i>The Measure of All Things</i> and <i>The Love Song of R. Buckminster Fuller</i>, featuring the indie rock band Yo La Tengo. Sam’s documentary <i>The Weather Underground</i> was nominated for an Academy Award and included in the 2004 Whitney Biennial. Is nothing American sacred anymore? The largest mall in the world turns out not to be the famous Mall of America in Bloomington, MN—it’s the South China Mall outside of Guangzhou, China. Outdoing the techniques of American consumerism, South China Mall is Disneyland, Las Vegas, and Mall of America rolled into one. There are carnival rides, mini-parks, canals and lakes amid classic Western-style buildings housing space for hundreds of shops. But along with the glitz and glory of middle-class shopping, the mall’s Chinese developers seem to have imported something else—a cautionary tale of capitalist hubris. Alex Hu, a local Guangzhou boy who made it big in international business, wanted South China Mall to be a hometown monument to his success—even though Guangzhou has no major airports or highways nearby. And four years after its construction, the mall sits virtually empty of both shops and shoppers. 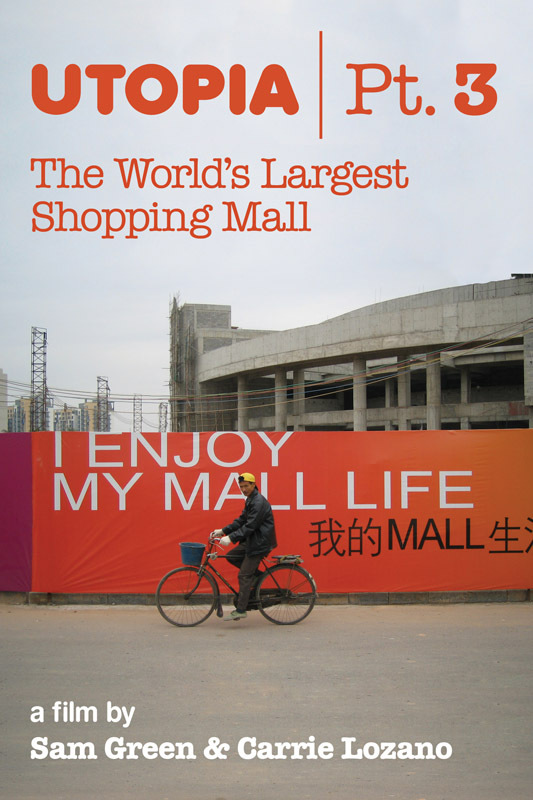 But the Chinese have imported yet another concept familiar to Americans—South China Mall is considered too big to fail. So, employees line up for flag-raising ceremonies and pep talks about “brand building” before going off to meticulously maintain the deserted concourses. If China is the future of the world economy, Utopia, Part 3: The World’s Largest Shopping Mall just may be a startling peek at what’s to come. You can watch the film on PBS here.